On Friday February 13th, there was a line of 27 container ships anchored at the ports of Los Angeles and Long Beach wanting to be offloaded. By Saturday, Valentine’s Day, that number had grown to 32. This bottleneck is primarily the result of a nine-month labor contract dispute between the union representing the longshoremen and the ship owners. The ship owners are accusing the union of work slowdowns. To retaliate, the PMA (a trade group representing the ship owners) has canceled night and weekend shifts to avoid paying overtime to the workers. It is estimated that the economic cost of one day of a lockout could cost $1 billion dollars. If the dispute is allowed to escalate, shutting down all 29 west coast ports, the economic consequences could be substantial. These ports handle approximately $1 trillion worth of cargo each year. 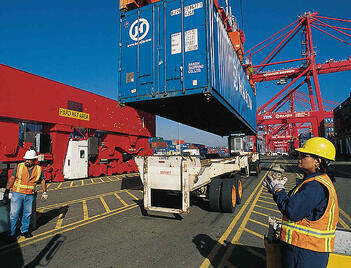 Los Angeles and Long Beach are the largest, handling 40% of all incoming cargo containers. At the urging of business people and politicians, The White House has decided to intervene by sending Labor Secretary Thomas Perez to help resolve the dispute. However, even if the contract issues are resolved tomorrow, it could take up to 6 months to process the backlog of freight rendering some products unsellable. Honda has already slowed production due to shortages of several key parts. Macy’s Department Store said the slowdown is impacting their inventories. In response to the delays, Tyson Foods has reprocessed meat exports that would have been shipped to China. Many businesses are re-routing their shipments to east coast ports or are opting to ship via air freight. Both options are costlier. However you can’t sell seasonal items if they don’t arrive in time. The consulting firm of Kurt Salmon estimated this backlog could cost retailers $7 billion in 2015. This labor dispute has exacerbated a growing problem with offshore suppliers. Cargo ships are getting larger, and shipping companies are filling this capacity with goods destined for a variety of customers. This co-mingling of shippers and products adds a great deal of time to the unloading process. Industry experts are urging retailers to reexamine their supply chain strategies. In the short term, companies should investigate east coast and gulf coast ports as well as air freight options. Long term, businesses should look to develop relationships with nearshore or onshore suppliers to meet their needs. Frank Layo, a retail and supply chain expert at Kurt Salmon, recently noted “We’re going to see more near-shoring [and] may even see more U.S. manufacturing” over the long term. There are many benefits to using an on-shore supplier. For many businesses, this West Coast port slowdown has created a sense of urgency to find alternative suppliers closer to home. Sources: Wall Street Journal, Omaha World Herald, New York Times, Bloomberg, Industry Week, Kurt Salmon consulting photo from Port of Long Beach website.